I absolutely love Poinsettias. The beautiful reds of the classic flowers, the elegant white and the wonderful shabby chic pink. 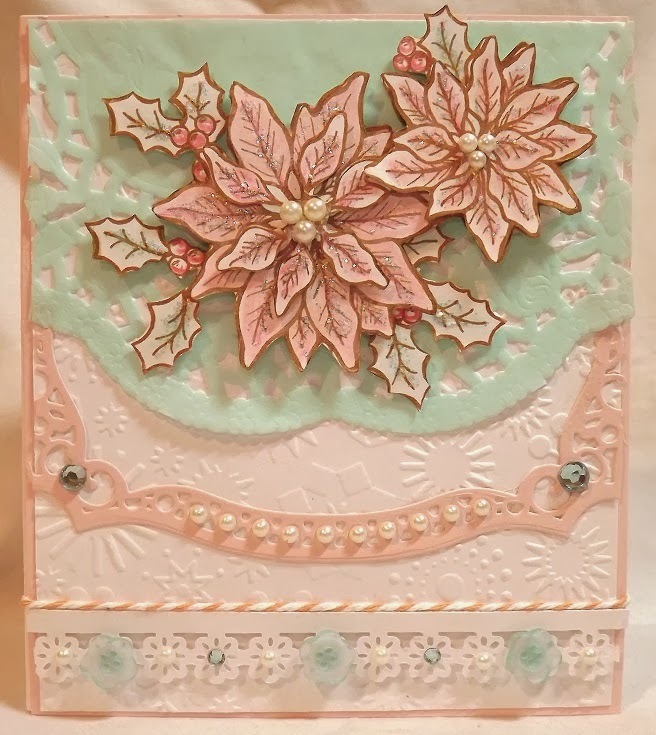 I recently saw a lovely display of pink poinsettias and it inspired today's card, which is a little different from a traditional Christmas Card. I am totally in love with this Poinsettias and Berries stamp. I have used it once this year in a classic red and still plan an white and gold card. This time I stamped with a sepia brown ink and then used my pencils and a gamsol technique to get the soft colors. The petals are also covered in icicle Stickles to really make this card sparkle. I raided my stash for the paper doily that I cut to size and used some adhisive gems, pearls and stones to give it some bling. The petals are also covered in icicle stickles to really make this card sparkle. EEEk!! Simply beautiful Mary Anne!